It’s been a rough year for Michael Statlender. Besides living in a nation where an orange tyrant sits in the White House, this poor #Resistance member was diagnosed with terminal cancer at the young age of 25. 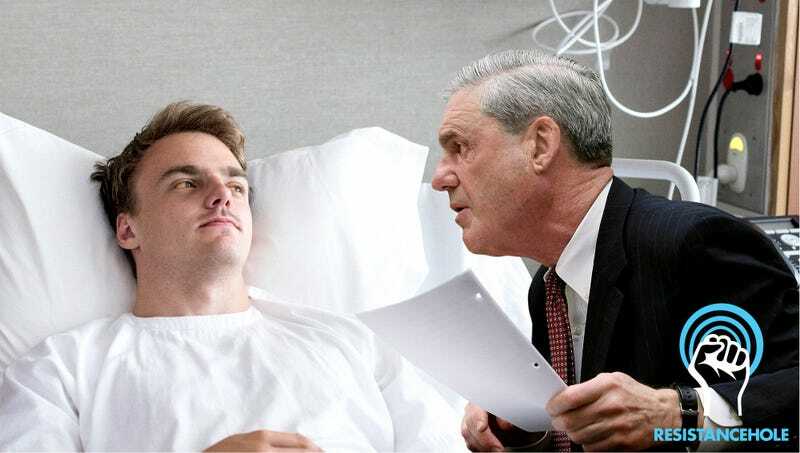 Fortunately, there are some seriously big-hearted people out there like Special Counsel Robert Mueller, who, after he heard what was happening, made the time to come to Michael’s hospital room to give him a sneak peek at the conclusion of the Russia investigation. Wow, what an amazing thing for Mueller to do. While the rest of us still have to wait a few months to find out exactly what Mueller discovered about President Drumpf’s collusion with Russia, Michael has known the answer since Monday, when Mueller, dressed in one of his iconic two-piece Brooks Brothers suits, paid him a visit in his hospital room and gave him an exciting glimpse at how the whole investigation is going to pan out. The two sat together for almost two hours as Statlender pored over various documents and the incredibly sweet and patient Mueller answered any questions he had about what ramifications the findings would have for the president and the nation as a whole. Whatever Mueller told Michael about the outcome of the Russia investigation, it was definitely something incredible. Michael could be heard crying, laughing, and gasping in turns for the duration of Mueller’s visit as he revealed every last detail about how his inquiry into the Trump administration will ultimately play out. At one point Michael could be heard through the closed door of his hospital room shouting, “Oh my god! I thought his political career was over, but he masterminded the whole thing!” A few moments later, the brave cancer patient was also overheard exclaiming, “But if that’s true, then she betrayed the entire Democratic Party!” Sadly, Mueller swore Michael to secrecy, so we won’t know exactly what he was talking about until the conclusion of the Russia investigation is finally released to the public. This is definitely the most heartwarming story we’ve read all day. It’s amazing that Special Counsel Mueller would take time out of his busy schedule to share these exciting secrets with a resistor in need. On behalf of the #Resistance we want to say “thank you” to Robert Mueller for giving Michael such a beautiful gift before he leaves this world. Simply amazing.